This project involved the refurbishment of a trio of 30 story apartment buildings built in the late 1970’s. 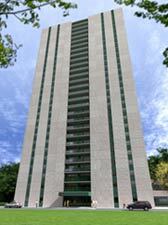 The location is very high profile as it is on a main corner of north Toronto’s urban centre. - glass panels to replace original metal balcony railings. - powder coated metal frames to support the glass panels. - membrane to coat the balcony slabs. - paint colour for all windows & metal panel siding & for ground level awning. - colour selection for the mechanical penthouse. - and finally, accent colour for the street numbers. The glass we selected was a lightly tinted green to tie in with the powder coat & paint colours. The membrane colour was chosen to blend in with the concrete siding for a more cohesive overall look. The mechanical penthouse tones in with the paint colour used for the metal siding, windows and awnings. The accent colour for the street number was chosen to give a unique touch to the finished product… a bit of sizzle. Below is an interview with the engineer that brought Colour Theory in on the project. At this point in time we’ve been engaged for three projects from Paul DaCosta and his firm The SPG Engineering Group , Oakville, Ontario. key location on a significant downtown corner property. Paul DaCosta : “ It has been a very positive experience working with you.